Decker Jones is a full-service law firm serving Fort Worth and the North Texas community. For more than one hundred years, we’ve participated in the city’s economic expansion and addressed the ever-changing needs of our clients. Rooted in this rich history, we’re a forward-thinking firm working to advance and protect the interests of the clients we serve. At Decker Jones we believe in a one-on-one approach to customer service. Each client has a single point of contact backed by a network of attorneys working together on their behalf. It’s how we give clients our full range of legal expertise with the personalized service they deserve. Our attorneys apply creative solutions to complex legal issues across a wide range of practice areas. We help clients achieve long-term goals while addressing their immediate legal needs. Versatility, strength of character, a thorough knowledge of the law and our commitment to client satisfaction is at the core of the Decker Jones firm.If you need legal representation, give us a call. We’re here to help. Decker Jones, P.C. originated in 1896 with the law office of George Q. MGown. 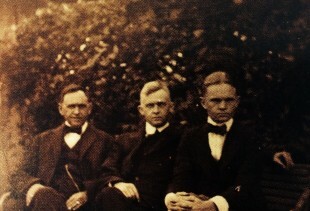 In 1922, George’s office became McGown & McGown when his son joined him. During this time in history, Fort Worth’s economy was growing due to the discovery of oil in Ranger, Texas. McGown & McGown represented many independent oil companies during the early development of the Texas fields in the 1930’s and 40’s. In 1929, the legendary Berl E. Godfrey and Robert Decker joined the firm which then became known as McGown, Godfrey, Logan & Decker. At that time, the firm was known for its knowledge in securities, tax, corporate and banking law. It held court on one floor of the Oil & Gas building and was known for their exceptional Christmas parties. Robert Decker became well known for his charitable work with the United Way and the Child Study Center. 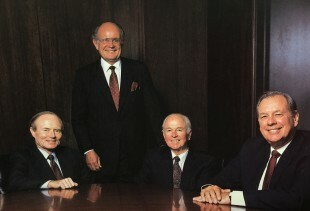 In July of 1990, John McClane of Decker, McMackin & McClane called Kenneth Jones of Jones, Hall, Bates, Warren & Watson to talk about merging a litigation firm with a corporate firm. It was a natural fit for two of Fort Worth’s most respected firms to join into one, full service firm. 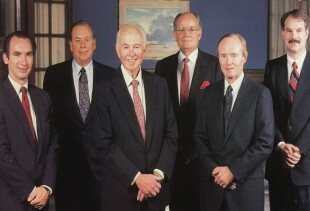 The merged firm name became Decker, Jones, McMackin, McClane, Hall & Bates, PC and remained that way until January of 2015. With over 30 lawyers, and being the fifth largest law firm in Fort Worth at the time, the firm enjoyed full trial dockets and plenty of mergers and acquisitions. Together, the two firms became one of the most trusted and honored legal institutions in Fort Worth. The full service value and values introduced by this new firm continue to be of highest priority to the lawyers of Decker Jones, PC today. 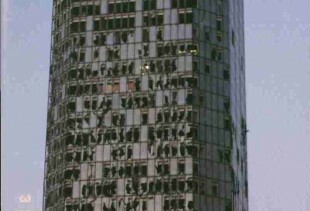 In March of 2000, many of the firm’s lawyers were seated at their desks when the Bank One Building (pictured) was hit by an F3 Tornado. The firm marched on and relocated to Burnett Plaza on Cherry Street. Having preserved many a decade of client files, our client’s businesses were not interrupted. 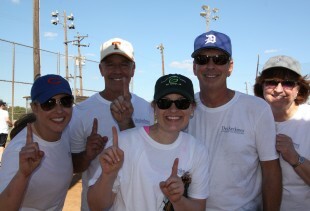 In 2014, attorneys, staff and their families gathered for a game of highly competitive softball to celebrate Decker Jones’ founders. There were definitely winners and losers and everyone’s fair share of rubbing it in, as pictured to the right. In 2015, the Shareholders voted to shorten the firm’s name to Decker Jones, P.C. The world had changed since 1896, and the firm had become known as simply Decker Jones. With 26 lawyers in 10 highly diversified practice areas, Decker Jones is known for its excellently skilled lawyers with generations of the finest reputations.